Authorities in Italy say they have seized works of art belonging to, and concealed by, the convicted founder of Italian firm Parmalat, Calisto Tanzi. 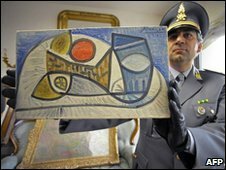 The 19 paintings and drawings, including works by Picasso, Monet and Van Gogh, are worth more than 100m euros (£90m), financial police said. Tanzi denied owning any secret art collection earlier this week, Italian newspapers reported. The concealed art was found in houses belonging to friends of the family. Parmalat, once one of Italy's leading companies, collapsed in a massive fraud scandal in 2003 with a 14bn euro ($20bn; £13bn) hole in its accounts. The case was Europe's biggest bankruptcy. Tanzi's son-in-law, Stefano Strini, is under investigation for allegedly handling the artwork. Officials said the artwork had been offered to buyers and that authorities had had to work quickly to seize it before it was sold. They said they had tracked down the trove of pictures using phone interceptions, following an investigative TV programme that was broadcast last weekend. Parma prosecutor Gerardo Laguardia, speaking on Italy's Sky TG24 TV, said: "We got lucky. We learned that there were negotiations under way to sell one of the paintings". Some of the phone calls involved discussions about selling some art to a Russian billionaire, Italy's Ansa news agency reported. Monet's Cliff Walk at Pourville was about to be sold for 10m euros ($14.8m; £9m), Ansa added. Among the pictures seized were a drawing of a ballerina by Degas, a tree trunk by Van Gogh, a Picasso still life, and a self-portrait by Antonio Ligabue. A Milan court sentenced Tanzi to 10 years in prison for fraud in 2008. He appealed the sentence and is free awaiting trial. 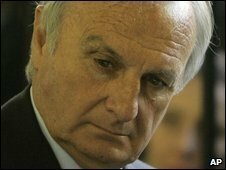 He is also accused of fraudulent bankruptcy in a trial under way in Parma.